Pygora Goats produce three distinct kinds of fleece. 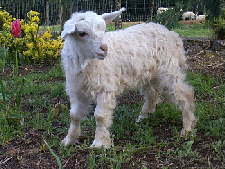 Pygora goats will produce cashmere-like fleece (Classified as Type-C), a mohair-like fleece (Type-A), or a combination of the two fleeces (Type-B). Type-A fleece is composed of fibers averaging 6 or more inches in length that drape in ringlets. It may occur as a single coat, but a silky guard hair is usually present. The fibers are typically less than 28 micrometers in diameter. Type-B fleece fibers average between 3 to 6 inches (150 mm) in length with one, possibly two, guard hairs. The fibers are usually less than 24 µm in diameter. Type-C fleece is very fine, typically 1 to 3 inches (76 mm) in length and less than 18.5 µm in diameter. Pygoras come in a handful of colors: White, red, brown, black, gray or a mix of the colors.